This is one of my favorite recipes to serve alongside the Thanksgiving turkey. I used to search for it every year in the grocery stores, until I realized that it's fairly easy to prepare (and it usually tastes better when cooked at home anyway). The best thing about preparing it yourself is that you can customize it to your own taste (for example, my family prefers it less sweet, so I reduce the quantity of sugar I use). 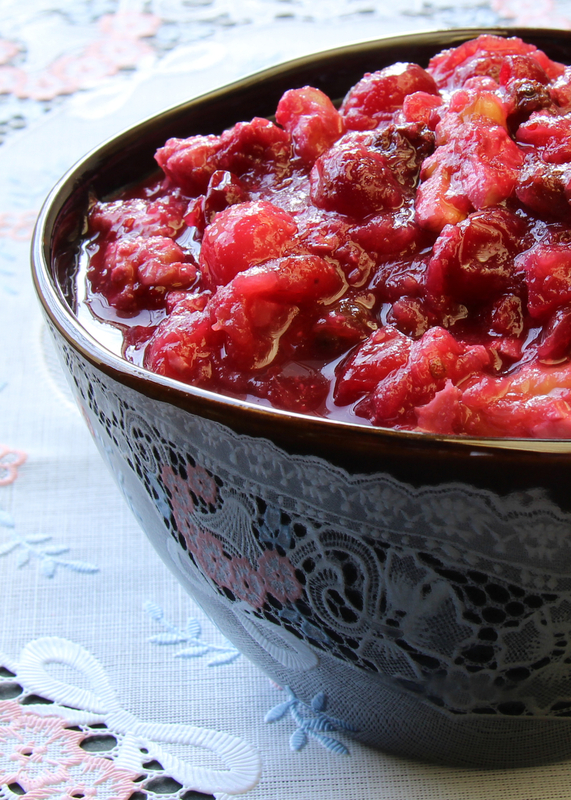 - Cook the cranberries, sugar, and water together on low heat, until the skins start to crack (about 5-10 minutes). - Meanwhile, peel the apple and cut into cubes. Once the cranberries' skins start to pop, add the apple and the orange and lemon juices. Cook until the apples become softer (about 15-20 minutes). - Remove from heat. Add the raisins and walnuts. Let cool, then refrigerate overnight (it thickens the dish). - The best presentation for this side dish is to serve it along the main dishes: the turkey or the glazed ham, the mashed potatoes, and the string beans.